Here at Bone Dry Roofing, we believe in showing our community just how much they mean to us. As part of the Better Business Bureau and winner of several awards, we have demonstrated our commitment to our customers, but there is always more we can do! We support many organizations to help give back. Bone Dry Roofing is proud to serve the homeowners in all of our communities. We understand not all homeowners are financially able to make necessary home repairs and/or improvements. To help give back, in 2009 we launched the Bone Dry Community Assistance Program, wherein we will repair and/or renovate a deserving family's home. A committee consisting of Bone Dry Executives will screen applications, interview potential candidates and assess the work needed in the home. The services provided by Bone Dry Roofing may include, but are not limited to: roofing, siding, windows, masonry, gutters, drywall, painting, and attic insulation. Individuals may submit an application for themselves or someone who is deserving and in need of assistance. Applications are accepted year-round. If you are interested in helping us with services or a monetary donation, please email [email protected] and let us know how you can help. In one week, thousands of volunteers worked for thousands of hours to build two structures — a new home for the McFarland family and a center for Pack House 2000. In addition, thousands of volunteers worked together to begin the transformation of the Martindale-Brightwood neighborhood. It is truly amazing what happens when we build together. Bone Dry Roofing is proud to have been a part of this inspirational project that helps so many families all across the United States. Bone Dry Roofing Indianapolis is proud to partner with Owens Corning and Reese Wholesale in the fight against Breast Cancer. 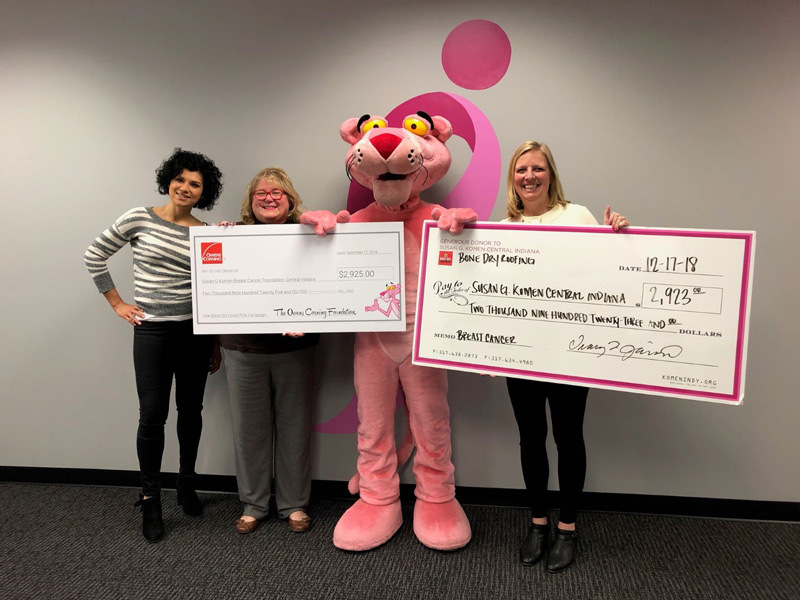 For every roof installed in October 2018, a donation was contributed to the local Susan G. Komen Central Indiana office. We were so excited to present a check for $6,948 to Carla Borden, Executive Director of Susan G. Komen Central Indiana. 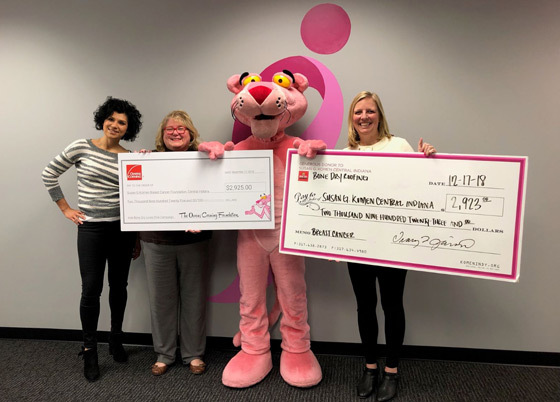 Pictured are Brenna Driver, Owens Corning Area Sales Manager, Carla Borden, Komen Central Indiana, “Pinky” Pink Panther from Owens Corning, and Tracy Jaisle, Bone Dry Roofing Indianapolis, Chief Financial Officer and breast cancer survivor.